Glanvilles Wootton is a small village of less than 200 people and around 100 houses located in north Dorset about 6 miles south of Sherborne. It is located in the beautiful Vale of the White Hart. 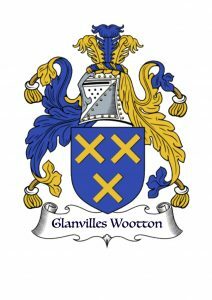 The coat of arms derives from Henry de Glanville who was granted lordship of Wootton Glanville in 1210. The parish was described having ‘nearly 1700 acres of rich land and the population of about 300.’ The family died out around 1790. 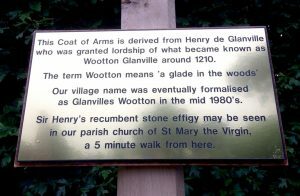 Many people locally used both names to refer to our village until the name, Glanvilles Wootton, was formalised in 1985. 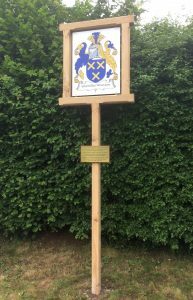 We now have a new village sign featuring the coat of arms derived from Henry de Glanville. Our village is named after him. This solid oak framework, jointed in the traditional manner for green oak, is the work of James House of Newlands Lane who generously gave of his skill and time in its construction. We welcome any feedback good or bad! The idea behind the website is to tell new people about our wonderful village and to keep all residents up-to-date about what is happening in and around the local area. This is a community website so contributions are always welcomed. The White Hart Vale Magazine, which comes out bi-monthly and is delivered free to all households, also gives this sort of information but covers all the seven villages that make up the White Hart Vale (Bishops Caundle, Caundle Marsh, Folke, Glanvilles Wootton, Holnest, Holwell and Pulham). There will be a new Council as from 1st April. The existing Councillors will continue in post until 2nd May with the Shadow Council and Shadow Executive Committee having responsibility for running the new Council until a new set of 82 Councillors have been elected. The new Ward of Blackmore Vale takes in the parishes of Pulham, Mappowder, Hazelbury Bryan, Fifehead Neville, Woolland, Ibberton, Okeford Fitzpaine, Lydlinch and Ibberton and replaces the former Lydden Vale Ward of North Dorset District Council which in turn is part of the Blackmore Vale Division of the County Council. Glanvilles Wootton becomes part of the Sherborne Rural Ward. Click here to support this very worthwhile cause. We have updated a few of the headings above and we now have a “Community Page“. This currently has three sub pages – news, history and nature. News includes our councillor’s blog, information about road closures, events that have happened in the village etc. History will be an evolving page with text and pictures added as and when we receive contributions. Nature is being written by our very own, Charles Dutton, about the wildlife in and around our village. If you would like to write an article for the website, please just put pen to paper or finger to keyboard and send it through to the website editors. Click here to find out how to support one of our villagers, Bernie, as she swims 22 miles the equivalent to swimming The Channel.